Moist, well-drained soil with a near-neutral pH. In cool climates, grow dwarf varieties against a wall, as an espalier. Semi-dwarf and standard pears make excellent landscape trees in large yards. Benefits from a mulch of well-rotted organic matter in spring, topped by a deep mulch of wood chips or sawdust year round. Mint, Borage, Calendula and Onions. Corridors within the orchard that are planted with clovers and other legumes contribute to soil fertility and attract pollinators. Prepare a large hole by breaking up the soil and adding plenty of well-rotted organic matter. A wide hole is better than a very deep one. Mulch after planting, and encircle the trunk with a wire cage or protective pipe to protect the young tree from animal and insect pests. Prune in winter to remove any dead or overcrowded branches and to shape if required. 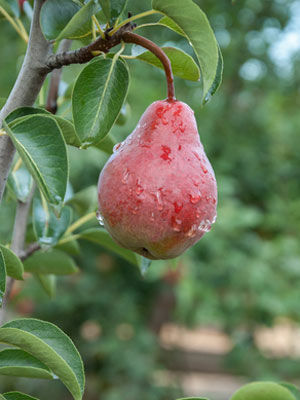 Most varieties need at least one other pear tree in the neighborhood to get good pollination. Healthy pear trees will bear for decades. Harvest pears before they fully ripen, and ripen under cool indoor temperatures. Very cool or hot weather can affect ripening, and leaving fruits on the tree for too long can cause them to rot from the inside out. Scab and other fungal diseases can cause problems for pears. Prune to improve airflow and avoid feeding with too much nitrogen. Fire blight can be controlled by trimming off and destroying affected areas as soon as possible. This bacterial disease strikes suddenly in cool, damp weather, and causes branches to look like they have been burned by fire. Codling moths can destroy crops of young fruits; trichogramma wasps can be used to control them, but insects are generally less of a problem with pears than with other tree fruits.